Ladera is the spanish word for hillside. This works to describe our wines; intense, distinct, hillside estate cabernet. The wines are fermented, barreled in caves and bottled. Tastings are either at a tasting bar or at a private table. Some include a sit down tasting and some are more casual visits. These are generally tailor-made to the circumstance. 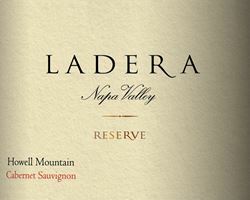 To join the wine club, visit www.laderavineyards.com or call 707-965-2445. Our Premiere Crew Wine Club offers unique wines, special pricing and private invitations available to club members only. Visit our website for complete details. Tours & tastings by appointment only. See our website for times and fees. Napa Neighbors get 10% off any wine purchase. Ladera Vineyards is certified under the Napa Green Winery Program by the Napa County Department of Environmental Management (DEM) and the Association of Bay Area Government’s (ABAG) Green Business Program and completed all the regulatory components needed for environmental sustainability. These components included developing water and energy conservation methods, preventing pollution, and reducing solid waste. In addition to developing sustainable winery practices, this program is set to become the standard for the state of California. Ladera Vineyards is certified under the Napa Green Certified Land Program. Ladera Vineyards has created and implemented a customized farm plan with measured results that addressed all aspects of its property, vineyard land as well as non-farmed land, including practicing soil conservation, water conservation, stable drainage, riparian corridor enhancement, fisheries and wildlife habitat enhancement and long-term improvement and sustainability.